Apple once again revolutionize how software should be made with their current incarnation of iLife '08 that makes multiple media creation a truly innovative and simplistic process yet maintains enough power to create some impressive looking results. The beauty of iLife 08 is that it releases the hidden muse in even the most creatively challenged user and offers the following applications iPhoto, iMovie, iWeb, iDVD and Garageband '08. The installation process of iLife '08 is a breeze and it simply auto-installed on our system with minimal prompting from the user. The system specifications of iLife require either an Intel-based Mac or Mac PowerPC G4 of greater to run this impressive software suite. Definitely one of my favourite aspects of iLife '08 is iPhoto which is the definitive photo collection software that makes organizing your photos a truly simplistic process. This program allows you to sort your photos in a variety of ways with the inclusion of the new 'Events' feature that automatically groups pictures based on creation settings. The interface has also been revamped and is quite fast, even when your photo library begins to get out of control. Skimming through photos is a pleasure which allows you to find that photo with ease. This new version also allows you browse photos on your digital camera and media cards as this was not possible in previous versions. You can even upload your photos to the .Mac web gallery to share your photos with other people, however there is a fee to use this service but you do get 10GB of storage space. Lastly of course, iPhoto also allows for basic photo manipulation to ensure that your pictures look their best. Now iPhoto automatically organises your library by Events, based on dates. Build a stunning online gallery using .Mac, where visitors can view and download your photos, and add their own photos from a Mac or PC. New tools let you edit like a pro and paste a set of adjustments from one photo onto another. Search your photo library in one place — filtered by name, date, rating or keyword. Create new hardcover photo books with customized dust jacket, large-format calendars and more. Print high-quality, frame-worthy photos with coloured textures, borders and mattes on your home printer. iMovie has received a much needed face lift that had Apple going back to the drawing board by revitalizing the interface and adding elements of iPhoto which allows you to catalogue all your video content. Apple have removed the complexities of previous incarnations and makes this one of the most easiest to use video editing software packages. The program also supports DV, HDV, MPEG-2, MPEG-4 and AVCHD which basically means just about everything. Wish to create YouTube video content? Simple! A click of the button and off you go but best of all, you can even change your videos to support iPhone and iPods. There's even the ability to add audio tracks to your video. All your video is automatically organised by Event in an easy-to-browse library. Easily skim through your video to review footage faster than real time. Drag favourite clips or parts of clips to a project and arrange scenes like slides. Add or view titles, transitions, and music in real time as you create. Publish movies directly to YouTube or .Mac Web Gallery. Send to iTunes to view on an iPod or Apple TV. iMovie supports standard and high definition video, as well as the most popular formats, including DV, HDV, MPEG-2, MPEG-4 and even AVCHD. The definitive music software has also returned again with Garageband '08 that once again contains return the user to this powerful program that contains everything you need to tweak your recordings. Whether you're mixing your music by adding vocals or instruments, Garageband does it all. There is even a "Magic Garageband" feature that creates pre-generated options, allowing for easier manipulation of those technically challenged people. Magic Garageband also allows to create a virtual band with nine genres available from Rock to Jazz which can then be used for your videos or even slide shows in iPhoto. Another impressive feature of Garageband '08 is that it features 24-bit audio, the ability to add multiple edits to your tracks and of course PodCast creation which is a must have feature of all good music software these days. Play with a hand-picked band on a virtual stage. GarageBand generates a new project based on genre and performance styles. Mark a region to repeat, record your part multiple times, and pick your best performance. Graphically adjust frequencies for each track by clicking and dragging individual EQ bands. Set multiple edit points in a track to automate EQ and effect changes like a pro. Give your songs new melodic character with a wide range of world-class solo and choir voices. For those dabbling at webpage creation, iWeb allows you to quickly create your own websites through a variety of themes and full integration with the .Mac network which introduces web widgets and a variety of other powerful web tools, ensuring that your websites has the flare you need. My favourite aspect of iWeb is the ability to switch themes on the fly and even integrate Google Maps and Google AdSense into your freshly created pages. Add live content from other sites, like video, stock tickers and headline news. Display up to 500 photos per album, complete with auto-pagination and viewing options. Give your site a personal touch with an address like www.yourcoolname.com using .Mac. Lastly is iDVD, a basic to amateur DVD Creation software package that contains a variety of themes to assist in your DVD creation. The menus available really give your video creations a truly professional appearance and you can import a variety of video formats. The interface is also streamed and once again Magic iDVD will assist those technically challenged to create those impressive end results. Apple-designed themes with animated menus give you more choices in 16:9 and 4:3 formats. Snappier response means faster switching between themes and menus to explore your options. New button library, drop zone editor, and dynamic alignment guides provide total control. Combine video and photos in your slideshows and use higher-quality photos. Maintain higher quality with more of your movies and slideshows on a single DVD. In conclusion, Apple have once again revolutionized iLife 08 by adding a variety of new elements and also streamlining the interface which will allow this program to be used by both novice to professional Mac users. 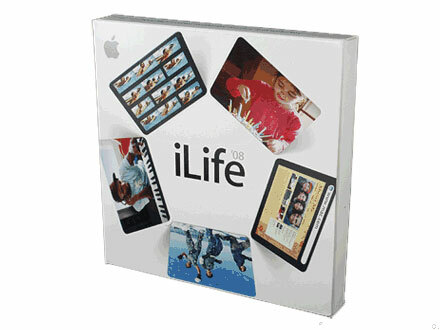 At an affordable price of $99AUD, there is little to complain about iLife '08 that we could recommend to all Mac users. The only downside to the program is that users must pay for the .Mac experience but for those starting out, it's the perfect addition for your Mac.